This weekend, A.V. Club contributor Caroline Siede is watching all of the first season of Marvel’s Jessica Jones on Netflix. After she’s finished with an episode, she’ll post a quick response. Though she’s working straight through the season, she’ll be taking some breaks, too, posting five reviews on Friday, four reviews on Saturday, and four reviews on Sunday. Weigh in on this episode in the comments below or discuss the whole season on our binge-watching hub page. Hot damn! That certainly wasn’t the penultimate episode of Jessica Jones I was expecting, but I’m so glad it’s the one we got. For most of its runtime “AKA Take A Bloody Number” is a surprisingly low-key character-centric episode, even moreso than “AKA I’ve Got The Blues.” I’m always a fan of character-driven stuff so I thought this episode was aces even before we were treated to a genuinely shocking twist ending and Jessica Jones’ best fight scene to date. “AKA Take A Bloody Number” opens with Luke filling Jessica in on his first meeting with Kilgrave. Continuing the trend of everyone in this cast having fantastic chemistry, David Tennant and Mike Colter make a great comedic duo with Tennnat’s peppy energy clashing against Colter’s grounded seriousness. It’s a lot of two person scenes this episode as Dorothy tries to reconnect to Trish by bringing her information about a mysterious research organization called IGH. Elsewhere Kilgrave is also dealing with parental issues as he forces his dad (who is maybe just pretending to be under Kilgrave’s control?) to create a serum that will strengthen his powers. While this show is always weakest when it takes time out to focus on its periphery characters, I even begrudgingly enjoyed the Malcolm/Robyn stuff, which got super weird and kind of sweet. But the heart of this episode belongs to Jessica and Luke, who team up to do some PI work, with Luke taking on the role of Jessica’s Girl Friday. While the show is inconsistent with it use of film noir styling, the return to investigating makes “AKA Take A Bloody Number” feel more apiece with the beginning of the season than some of those middle entries did. Jessica and Luke continue to be perfect together (which Trish picks up on immediately), and this episode lets them connect on a deeper emotional level than they have before. Which is why it’s devastating when Kilgrave (who tests out his powers at rock concerts, which is amazing) reveals he’s been manipulating their relationship this whole episode. Although Jessica was extra cautious, even she couldn’t have predicted that Kilgrave would use her sort-of-boyfriend as a human puppet in a twisted attempt to prove that Kilgrave and Jessica are the ones with real sexual tension. (Which is arguably even more fucked up than threatening to maim your dad’s hand with a blender). I adored Luke’s line, “I’ll say it every day for as long as you need to hear it,” and it made me appropriately squeamish to learn Kilgrave was the one who wrote it. The episode ends with a knockout brawl between Jessica and Luke. While Jessica Jones has struggled to create compelling fight sequences in this past (I was a little disappointed with how easily Robyn and co. were able to overpower Jessica a few episodes ago), “AKA Take A Bloody Number” finally takes advantage of the fact that its leads are superheroes. Luke and Jessica punch through walls and rip off car doors to get at one another. While Luke can’t totally shake off Kilgrave’s control, he does manage to give Jessica enough time to shoot him in the head. Back in “AKA It’s Called Whiskey” Luke admitted he isn’t sure how indestructible he is. I guess we’re about to find out. Just one more episode left, fellow bingers. Let’s do this! 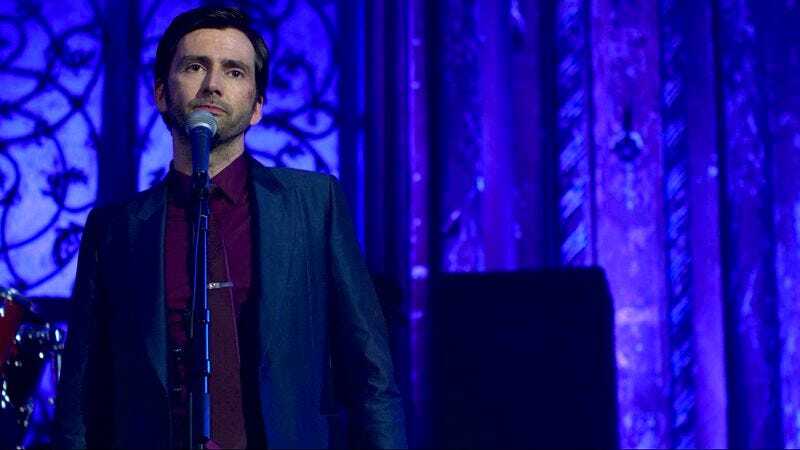 Frustrating moment: The show needs to decide if Kilgrave’s powers can be stopped by a vaccine (as Albert thinks) or an emotional mindset (as Jessica thinks). It’s really confusing to have it both ways.